Thousands of Saudi women are turning to an app to figure out how they can get the law on their side in the deeply conservative kingdom. The "Know Your Rights" app was launched in July 2016 by a Saudi lawyer, Nasreen Alissa. It has been downloaded 55,000 times since then. "I noticed whenever I go out to gatherings and meetings, women did not know their rights, even educated women, women who studied abroad didn't know their rights," Alissa told CNNMoney. "I figured why not create an app and I can always update it with new laws and regulations." After studying in the U.K. and Canada, Alissa moved to Saudi Arabia in 2012 to be closer to her family and work as a corporate lawyer. That's when she started working on "Know Your Rights," investing her own funds to build the IOS and Android app. Saudi Arabia's legal framework is based on Islamic law, and also incorporates royal orders and decrees. A system of guardianship laws makes it hard for many women to work, travel, undergo medical procedures and go to university without the permission of a male relative or spouse. Other rules, such as dress codes or the ban on women driving on public roads, are based on interpretations of religious edicts. Saudi police this week detained a woman who was shown in a short video on social media walking in public wearing a miniskirt and a crop-top. Officials said she was dressed in "offensive clothing" but later released her without charge. There are few free sources of advice for women left confused about what they can or can't do. Alissa's app offers help in important areas of family law. "Know Your Rights" covers issues such as divorce, custody of children, inheritance and domestic violence. Alissa said she is trying to find ways to help women become "normal, regular" citizens. 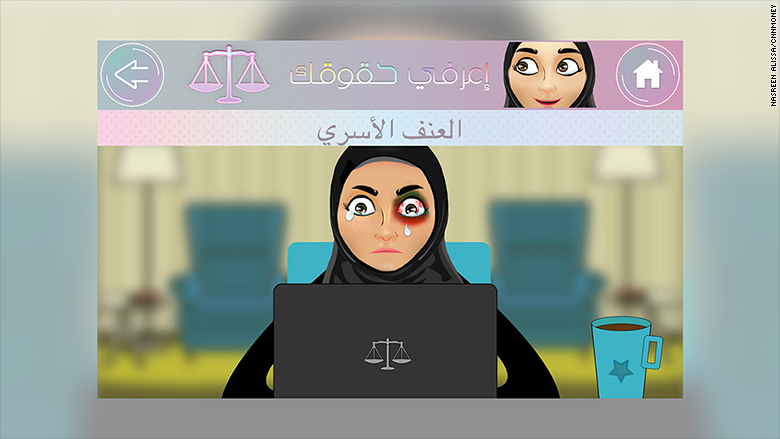 The app uses animated videos to tackle difficult situations women face. For example, a 45-second video shows a woman in a troubled marriage with an abusive husband and asks how she can split from him so she can provide her children a healthier environment. It also answers frequently asked questions, such as "I want to get married, but my guardian is objecting to the idea. What shall I do?" There's a section for expats who are married to Saudi men, and a directory of lawyers. Alissa would also like to introduce a system for women to rate and review judges based on their experiences in court. Human rights groups have long criticized the kingdom over its treatment of women. But there are signs of change. King Salman ordered a review of some of the guardianship laws in May, and his son -- Crown Prince Mohamed bin Salam -- is leading an economic overhaul, known as Vision 2030. One of the goals is to get more women into work. "Saudi Arabia has a tremendous opportunity to root out all vestiges of the guardianship system," Sarah Leah Whitson, Middle East director at Human Rights Watch said in a report in May. "The king should also require state agencies to actively prevent discrimination by private individuals and businesses." Alissa said many laws and regulations need updating. She wants the Ministry of Justice to change some legislation, such as the legal age for when a girl is considered an adult. Alissa said the age for a woman is not determined but it is set at 18 for men. She also wants to put an end to child marriages. "An app is not enough... the country is moving forward in that but it's really baby steps," she said. Alissa, who relies on a team of 10 volunteers, has no plans to charge for the app's family law service because it's all about "helping people," she added.